Setup is all Kicker, with a 12" subwoofer and a ZX700.5 700-watt 5-channel amplifier, as well as two 3" door tweeters. For putting the gear in, the subwoofer was rotated 90 degrees to the right, and slid all the way over to the left side of the hatch. Rear seats were also folded down. Guitars were placed to the right of the amplifier, and the backpack was placed to the left of the amplifier (right where those two cables were positioned). When we got back home, we removed the gear, and it was at this point when my dad removed the backpack, that we suspect the damage shown above happened. Where the cable should’ve been. Ooh, an Alan Key screw! As you can see, we discovered that night that it was an Alan Key screw. 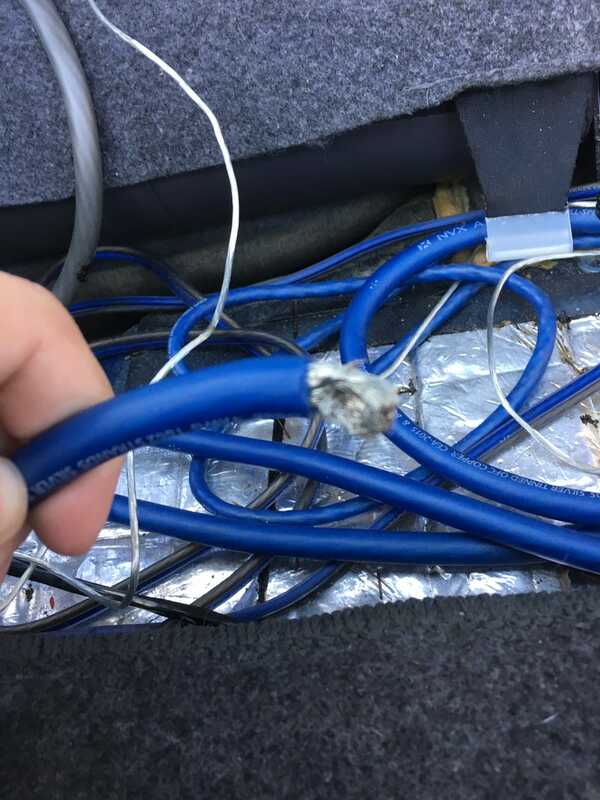 So, on Wednesday we managed to reconnect the cable, except for a major issue: the subwoofer was producing no sound whatsoever, and all the speakers in the car were putting out a tenth their normal output (had to be cranked to 40+ on volume to even hear music). So, I lived with it, planning to get it fixed this week. That’s when the big issue started. The centre console turned on, but the engine didn’t turn over. Fast forward to attempting jumper cables and pulling out/re-inserting fuses in the amp, and still met with the same sound. After 6-7 more attempts, we really drained the battery. 3. Buy a new battery and hope it solves the issue. 4. Attempt the jumper cables again (we saw no sparks connecting the leads, so we suspect the cable’s contacts are worn out). So that’s my rant/story thus far. Any input on the matter is greatly appreciated.